Building on the brand's team-specific offerings, 2016-17 Futera Unique Liverpool is entirely dedicated to The Reds. Each pack includes one special insert or relic while display boxes promise an autograph, The Mythicals relic or one-of-one insert. 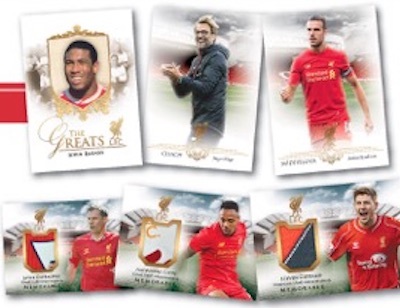 The 50-card base set documents past and present players, as well as coaches for Liverpool FC. Meanwhile, the 40-card Heritage set puts a retro spin on many of the same names from the base set and averages 1:2 packs. 2016-17 Futera Unique Liverpool is also loaded with premium hits. Featuring game-used or training-used memorabilia pieces, the relics come in several themed inserts. Memorable features 11 top subjects and Superstars covers 17 more options, with each relic set numbered to 43. More elaborate are the Kitcard inserts that feature dual relics for 12 cards and a print run of 27. The ultimate chase is the first Kitcard in the production run for each player that features a certified diamond. Both incorporating actual gold plating, Memostars (#/15) utilizes a 24ct gold-plated title while The Mythicals (#/7) showcases a 24ct gold-plated frame. Doubling up the relic hits in 2016-17 Futera Unique Liverpool, Team Heroes (#/32) and Then & Now (#/29) pairs two current or former players. Collectors can also find rare Autograph inserts. 2016-17 Futera Unique Liverpool Soccer is limited to just 30 total cases. Popular clubs Manchester City and Arsenal also have team releases from Futera in 2016. 2016 Futera Liverpool Jurgen Klopp 30 Incredible Auto 3-Color-Patch 1 1 RARE! 16 subjects. Serial numbered 1/1. 40 cards. 1:2 packs. Serial numbered #/30. 12 cards. Serial numbered #/27. The first card for each player (#1/27) features a certified diamond. 11 cards. Serial numbered #/43. 10 cards. Serial numbered #/15. 39 cards. Serial numbered #/7. 17 cards. Serial numbered #/43. 7 cards. Serial numbered #/32. 6 cards. Serial numbered #/29. 11 cards. Serial numbered #/35 or less. 9 subjects. Serial numbered 1/1. 38 subjects. Serial numbered 1/1.